Always a great way to give! 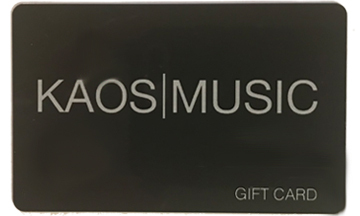 KAOS Music Centre Gift Cards can be used for anything in our store including any of our lesson programs. They also never expire so you can use them anytime. Gift Cards are available for purchase online here, or in person in our store. If you are purchasing online, we will mail your gift card to you the next business day. Delivery time will vary but you should usually receive your card in 2-3 business days. Simply choose your Gift Card amount from the drop down list and click on the “Buy Now” button. You will be directed to PayPal to pay for your card and provide your mailing information.